Translation and commercialization of products is rarely a linear process, but instead is typically an iterative process where new knowledge and necessary adjustments are incorporated into the development path. Your research activities can lead to impactful discoveries and inventions. An invention is a novel and useful device, method, composition of matter, process or any associated new or useful improvement. Sometimes the practical application of a research discovery is not immediately recognized, and we encourage you to consider practical applications of your research and contact us if you have any questions. How might publishing or presenting my research impact intellectual property and the ability to commercialize my research? Public disclosure of your research (presentation, poster, published abstract, web posting or any public presentation) will hinder or prohibit patenting efforts. Patent protection is critical for commercialization of some technologies, and therefore it is best that you contact our office well in advance of any public disclosure so that we may consider the need for protection. Are there things that I should consider before sharing materials or intellectual property with other institutions or companies? Sharing materials is an important part of research and collaboration. Recording of materials shared with other institutions or companies along with any conditions of use is important, and is managed through a Material Transfer Agreement (MTA). Sharing of confidential information can be managed via a Confidential Disclosure Agreement (CDA), which serves to protect the rights and use of confidential information that is shared. An MTA is a contract that describes terms for the transfer of materials between two organizations for research purposes and describes the rights of the respective organizations concerning the materials and any derivatives thereof. A CDA is a contract between two or more parties stipulating that shared information will remain confidential and not be shared further. CDAs can protect information shared by one or both parties. Can I use materials or intellectual property from others in the course of my research? Yes, however it is important to record and understand any conditions for your use of the materials and any conditions that may impact the ownership and rights to your research. This may include abiding by obligations set forth in an incoming Material Transfer Agreement (MTA). In a sponsored research situation, what rights does the sponsor have to discoveries arising from my research? A Sponsored Research Agreement (SRA) will outline the arrangement between you and the sponsor, stipulating intellectual property ownership and rights to research conducted prior to, during, and after the outlined sponsored research period. The sponsor may have rights to license or in some cases own inventions arising from the sponsored research. These rights are generally limited to research within the scope of the SRA but make sure the Office of Sponsored Research is aware of any concerns you may have regarding any grant of rights to the sponsor. If you are a researcher with a potential new idea or discovery, we strongly encourage you to contact us early so that we can evaluate the opportunity together and determine if formal disclosure to the University is warranted in the form of a Report of Invention (ROI). An ROI is a confidential, written description that describes your invention so that options for commercialization can be evaluated. If patent protection is a consideration for your invention, any public disclosures including presentations, publications or discussions with external partners will compromise our ability to obtain patent coverage outside the U.S. We prefer that you complete an ROI at least 30 days prior to any public disclosure to provide adequate time for evaluation. When should I disclose an invention? You should disclose an invention if you have invented or discovered something novel that you believe may have commercial value. It is important that you disclose your invention prior to any public disclosure. Public disclosure of your research (presentation, poster, published abstract, web posting or any public presentation) will hinder or prohibit patenting efforts. Patent protection is critical for commercialization of some technologies, and therefore it is best that you contact our office well in advance of any public disclosure so that we may consider the need for protection. If you have any questions about your invention, or whether you believe it merits disclosure, please do not hesitate to contact OTC. How do inventors and the University benefit from disclosure and licensing activity? Who has rights to my invention? Inventions conceived by employees of the University (faculty, staff, student employees) as a result of their employment responsibilities or by anyone through use of University resources are typically owned by the University. Should I disclose research tools and reagents? If you have research tools (antibodies, cell lines, mice etc.) that other researchers and companies might benefit from, we can help you with transactions if you disclose the tools accordingly. Most research tools and reagents are not patented. Licensing of research tools can provide revenue to support development and maintenance costs, and transfer the burden of distribution on the part of the inventor’s laboratory or program. What happens if I invent something together with someone from another institution? We will work with you and representatives from the other institution to jointly determine respective rights to the invention and potential commercial direction. Typically, an Inter-Institutional Agreement is developed that describes respective ownership and roles of the contributing institutions. We will also evaluate any pre-existing agreements between the institutions. If I am interested in starting a company around my invention, is there someone that I can speak with? Members of the KickStart Venture Services group can speak with you about your options for forming a startup. Our staff will meet with you to discuss your invention so that the invention and its applications are mutually understood. Evaluation of the invention includes examining factors such as potential commercial applications, competitive technologies, feasibility of development and manufacturing, and patentability (if applicable). We will consider these aspects along with your input, and together make a decision about whether or not to proceed with commercialization. Some inventions may require additional development or information before commercialization can be pursued, and together we can develop a plan for moving forward. This assessment will also guide a potential business strategy, specifically whether we plan to license the invention to an existing company or form a startup company. We will evaluate this strategy together and support you in whichever path is chosen. What are some of the considerations in deciding whether to license an invention to an established company or form a startup company? Inventions and technologies early in development with potentially radical impact, strong intellectual property, broad application and significant customer value are typically more suited to startups rather than established companies which typically favor more developed and less risky and disruptive opportunities. The Office of Technology Commercialization will work with you in consideration of your interests and your invention(s) to determine the preferred commercialization strategy. Inventions can be protected using patents, copyrights and trademarks. Utility patents are the most commonly used patent type and can protect any new, useful, and non-obvious process, machine, article of manufacture, or composition of matter. Copyrights protect creative expressions and works of authorship, including software, and trademarks identify the source of commercial goods. 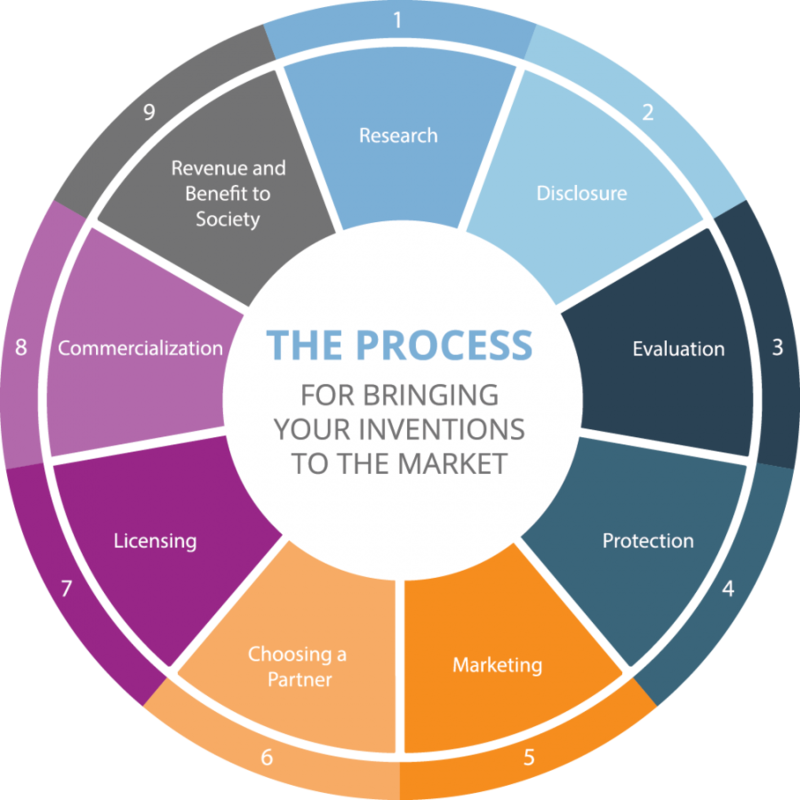 Protection for some inventions is essential for commercialization, as it provides exclusivity for those who are willing to invest significant resources and capital into developing a product. Other inventions do not require patent protection, and we do not file for protection of all inventions. Our staff and attorneys will work with you to develop an optimal strategy for protection of your invention. For further information on patents please see the patent process outline. “. . . any new and useful process, machine, manufacture, composition of matter, or any new and useful improvement thereof . . .” per Section 101 of Title 35 U.S.C. Patentable subject matter must be novel, non-obvious (involving an inventive step) and useful. Public disclosure of an invention prior to submission of a patent application precludes patenting outside of the United States and Canada. How much does it cost to file for and obtain an issued patent? Costs vary depending upon the breadth of the patent protection sought, and often range from $20,000 to $40,000 for a U.S. patent to issue. If foreign patent protection is sought, patent costs can reach the same amount or greater for each individual country in which patent protection is sought. Please see the patent process outline for further information. Patent applications are confidential until 18 months after the earliest filing date of the application (usually the provisional filing date), when they are published and publicly available. Identifying companies that have the interest, expertise and resources to develop products in similar fields as your invention can be extremely helpful in garnering information, feedback and interest in your invention. Potential investors can also be a valuable source of information. We welcome your inputs on potential contacts in industry and business, and we will also identify contacts for engagement. Feedback from industry and business contacts can be extremely valuable for continual assessment of commercial viability and interest, and can also help us refine the business strategy for commercialization via established or startup companies. Marketing efforts may include the execution of a Confidentiality Agreement (CDA) for the purpose of sharing confidential information about the invention so that it may be evaluated. We strongly encourage and welcome your involvement in this process. How are inventions marketed to find commercial partners and can I help? Inventions are typically marketed through established relationships that the inventors or licensing staff have with contacts in industry or business. Evaluation of the patent landscape, market research, and similar technologies may help identify other potential licensees. Publications, presentations, conference attendance and web postings are also excellent means of raising the awareness of an invention and garnering commercial interest. Information from inventors on potential commercial partners is very valuable and often the source of licensee contacts. The inventor is the best person to describe their invention and its benefits and your involvement is essential during the marketing process. How long does it typically take to identify a commercial partner? The time required to identify a commercial partner varies greatly, sometimes taking years, depending upon how developed the invention is, how well it addresses existing unmet needs and if it is found to be an attractive solution. We will continually evaluate the invention with your help and feedback from commercial entities. Working together with you we will select the most appropriate commercial partner. Consistent with our mission of bringing inventions to market for the betterment of society, we look for a partner that is best able to support the development and marketing of an impactful product. Several factors may influence our decision on the choice of a licensee. Qualities of a desirable commercial partner might include sufficient resources and funding for product development, expertise and products in the same field, past success in bringing products to market, experienced management and a business plan for developing the product(s). If the best business strategy is determined to be the formation of a startup company, staff in our startup services group can work with you to conceive, create and support a startup. Do I have input into choosing a commercial partner? Yes. We will review potential licensees with you for your input to ensure that the commercial partner and the proposed transaction is a suitable choice. What if we cannot find a commercial partner? Sometimes we will not find a commercial partner, and in this case we hope to receive feedback on potential improvements and modifications for moving the technology forward. In some cases, we may consider an alternate business strategy, such as a startup company versus licensing to an established company, and commercial feedback will remain valuable. A license agreement is a contract between the University and a “licensee”, where the licensee (typically an established or startup company) is allowed rights to an invention belonging to the University. The University’s primary goal in licensing technology is to maximize the likelihood that products derived from the invention will have meaningful impact in the market in a timely fashion. For established companies, there is often negotiation of the license terms that reflect protection of the University against liability, fair market value of the invention, and product development diligence on the part of the licensee. Fair market value is determined in part by how well developed the invention is, the costs of further development, and the anticipated market value. Comparable licensing deals completed in the same field are often used as benchmarks. For startup companies, near-term financial considerations are minimal to facilitate startup formation and growth. Inventor participation and understanding of the licensing terms and stipulations is essential. For more information please see the License Agreement Overview. Can an invention be licensed to more than one commercial partner? This often depends upon the technology involved and if further development and investment is required to bring a product to market. For instance, research tools and reagents are often market-ready and licensed to multiple commercial parties. A company will typically demand exclusivity to an invention where a substantial investment is still required to develop a product. Will the licensing terms be discussed with me? Yes, our staff will review the licensing terms with you so that you understand the obligations of the licensee as well as any obligations placed upon you or the University. What is conflict of interest and how is it managed? Please refer to our Conflict of Interest summary for information. The licensee, whether an established company or a startup, continues obtaining and allocating resources and capital to develop and refine the product, obtain regulatory approvals if necessary, manufacture and market the product. Our office will monitor the performance of the licensee during the term of the license agreement and assess that milestones have been met per the terms of the agreement. Can I contribute to further development of my invention during commercialization? This depends upon many factors, including obligations in the license agreement, the licensee’s interest in further using your expertise, and your interest in additional involvement. Established companies often have a clear vision for how an invention fits into their business strategy and what product will result. In contrast, a startup company may value input from an inventor on aspects of technology and application for a longer period of time. However, startup companies often change their strategies along the development path. Each situation is unique. What happens if the licensee is not able to commercialize the technology? License agreements typically include diligence milestones that hold the licensee accountable for development and commercialization of a product. If these milestones are not met, termination of the license may result and the invention may be licensed to another party, for example. Licensing revenue returned to the University is distributed to the inventors, their departments and the University per the UNC-Chapel Hill royalty sharing policy to support the faculty, staff and continued research and education. If revenue is returned from commercializing an invention, how is it distributed? Revenue generated from licensing activity is distributed to inventors, departments and the University in accordance with University policy. How are revenues distributed if there are multiple inventors? Multiple inventors will share revenue equally unless otherwise agreed in writing by the group of inventors. Can I waive my rights to licensing revenue? Yes, as long as all of it is waived. In this case, the waived inventor share of licensing revenue will be distributed to your department in addition to the normal departmental share.